The thought of manned space exploration conjures many emotions from the initial “can we do this?” in the late fifties and early sixties to the space race to the landing on the moon and how we’ve progressed since that July day in 1969. On one hand those that are space aficionados can’t get enough and any mission into space is an exciting one that opens up news areas of discovery, scientific findings and wonderment of what we can do if as a people we apply ourselves. Then there is the element of national pride – the pride that led and united many Americans to cheer the space program on as we wanted to beat the Russians to the surface of the moon, but after winning that game we weren’t interested creating a dynasty or hearing the noise of the crowd cheering us on to another great leap in space. There was only one Super Bowl in the space race and that was landing on the moon. In late November when the eighteen countries that support the European Space Agency met and laid out a three-year plan I was interested to see if manned space flight would make the cut. The European Union is about the economic equivalent of the United States and has a roughly equivalent technical base. One could argue that in some ways ESA is better positioned to conduct future manned space operations than NASA may be in the coming years. Even President-Elect Barack Obama’s transition team has questioned NASA about using ESA technology for manned flight or Japan’s HII-A. ESA has a proven rocket in the Ariane 5 that could lift a manned capsule into low-earth orbit. It also has developed the Jules Verne module that successfully launched and docked autonomously with the International Space Station and could be fitted with a capsule to carry a crew. Lastly, ESA members have had on and off discussions with the Russian Space Agency about developing a version of the Russian Kliper (Clipper) for the European space program. 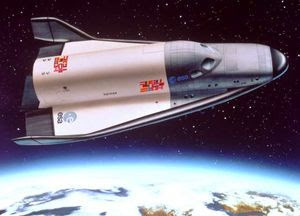 The Kliper is a winged space plane for crew transport on a par with the American Orbital Space Plan that was cancelled in lieu of the Constellation program. When the meeting was complete ESA agreed to an ambitious set of unmanned space missions, but no commitment to manned space flight in the next three years. As we look back, the analogy of the space program to a Super Bowl may have been correct for that one stepping stone of landing on the moon, but it could turn out that in fact the race was a marathon and after the moon landings instead of building on our lead we decided to set a slower pace and may have underestimated the skill of our competitors. For now we have now found that the pack has caught us and we are in danger of slipping behind. ESA’s commitment shows that they are interested in competing, but not necessarily winning. Despite economic troubles Russia remains steadfast, China is in to win and Japan and India will surely stake a claim as will other nations that have dreams of space. The group that is now out in front is Russia. Despite losing the moon race the Russian strategy for space has been consistent. A brief experiment with a shuttle program had been their only deviation from a steady course and even that experiment did not place them in a position of having only having one system at a time. When the Buran didn’t pan out, the existing spacecraft and it’s production line were still in place. Now, Russian space technology is so reliable we use it to deliver astronauts and cargo to the ISS. China has bought Russian space technology and consulting services to build its program and India will likely follow the Chinese path somewhere in the near future. Russia has become a net exporter of space technology and America may become a net importer of space capabilities if the current indicators are correct. If the Space Shuttle retires in 2010 we will be a customer of the Russians for at least the next three years, but more likely five years until and if a replacement is built. With all that has happened to our country over the past forty-years it would be an irony and something that we must reflect deeply on if the country that led and won the race to the moon resorted to outsourcing getting American astronauts into space to countries and programs like ESA (European Space Agency), Russia and JAXA (Japanese Space Program). As one of those space aficionados I’m interested in seeing many countries succeed and venture into space, but America’s pride and prowess in space technology would be tarnished if we let those that weren’t even in the race when we landed on the moon provide us with the means to get there.